The Cast of Colorblind: The Katrina Monologues. Photo courtesy of Arena Players, Inc.
Late Saturday afternoon, thick, ominous thunderstorm clouds stretched across the Baltimore skyline, engulfing every ray of sunlight. As theatergoers made their way through the doors of Arena Players, Mother Nature hinted at what happened to the city of New Orleans nearly 12 years ago. Soaked through from the torrential rain, we were greeted by happier sounds, those of Rebirth Brass Band. “Colorblind: The Katrina Monologues” opened with all actors on stage, frozen in time, as Gabrielle Edgerson and Ambrey Tyler, danced from the back of the theater up onto the stage in sheer, white skirts. As they weaved in and out of the actors, audio clips from the moment Hurricane Katrina struck land played over the speakers. As Edgerson and Tyler slowly, but purposefully, walked off stage, it was made very clear that Hurricane Katrina changed everything, even before we knew any of the characters or their stories. “…Colorblind: The Katrina Monologues” was more than I hoped for and exceeded any expectations I had of a play touching on such a traumatic event in American history. The play’s cast and crew did a phenomenal job exploring the raw emotions and honest reactions stemming from individual and collective loss during and after the storm. Each actor brought a unique perspective to the dichotomies running through the 10 monologues, namely: time versus space, life versus death, government versus the people, black versus white, and man versus nature. Don Murray did an impressive job opening and closing the play as The Dead, giving life to one of the many bodies which lay in stagnant flood water for weeks. Performances by TiaJuana Rountree, the Elderly Woman in a Nursing Home, and Dawn Taylor, a NOLA Police Officer, brought tears to my eyes and caused me to hold my breath until the lights dimmed. Murray returned on stage during both of these women’s monologues, signaling their deaths, one having been left behind, the other by choice. Throughout the play, the scene shifted from the streets of New Orleans to an airplane returning from Iraq to the neighboring state of Texas. Sound Designer Mari Andrea signaled the passing of time and shift between the different stories with a mixture of audio news clips, storm sounds and music. Meanwhile, Andrea R. Crews, scenic design, made it equally as easy to imagine characters’ surroundings with just a few props. Two fleur de lis were painted on both sides of the stage and an American flag was painted on a collection of sticks in center stage. The simplicity of the stage highlighted the nothingness most of the characters were left with, or became, after Hurricane Katrina. Playwright Tom Flannery’ decision to explore a variety of voices, ages, scenarios and outcomes really drove home the multitude of ways Hurricane Katrina encompassed the Big Easy, both literally and figuratively. Meanwhile, director Mari Andrea’ program note and words during intermission gently reminded the audience of their duty to stay active in their community and advocate for social change. 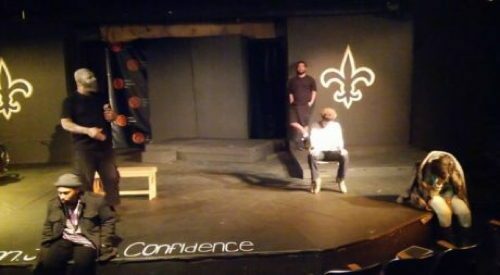 In sum, Arena Players’ production of “Colorblind: The Katrina Monologues” was more than I hoped for and exceeded any expectations I had of a play touching on such a traumatic event in American history. “Colorblind: The Katrina Monologues” played from February 17-26, 2017 at Arena Players Inc. in Baltimore, MD. For more information on upcoming shows at Arena Players, call the box office at 410-728-6500 or click here.